Make my openwhyd.org profile playable from a pure client-side HTML page (i.e. 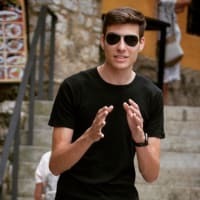 without API/back-end server), using Jekyll. 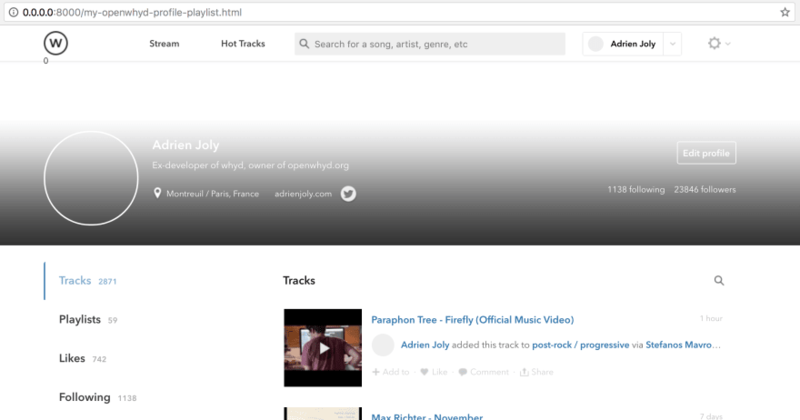 Openwhyd is a platform on which music lovers collect songs that they've found online, on Youtube, Soundcloud, Bandcamp and several other streaming platforms. It allows them to make cross-source playlists, to play them from their laptop or iPhone, and to share their discoveries with other music lovers who subscribed to them. This situation got me thinking: would it be possible to keep using Openwhyd without having to pay for hosting? As I'm a big fan of GitHub Pages, the first solution that came to mind was to get rid of the back-end part of Openwhyd. Turning it into a pure client-side web app (a.k.a. static web app), in which the database would be replaced by data files rendered with Jekyll. But I figured that just being able to play your own playlists would be a good compromise between utility for users and technical complexity to make it work. If I get this to work, it would allow some Openwhyd users to still be able to play the tracks that they spent years collecting, even if our back-end were to go offline some day. When reaching the last track of the page, WhydPlayer.js asks the back-end for the next page of tracks and appends them to the list. Based on this (simplified) flow, we can notice that the back-end is only solicited on steps 2 and 6: to fetch and render tracks from the playlists. The rest is done by WhydPlayer.js and other client-side logic. Step 2 could easily be done on a static web hosting provider like GitHub Pages: we would just have to store the user's playlists as HTML pages. The WhydPlayer.js would still work from it, as long as the DOM structure contains all the data that it needs to stream the music of each track. Step 6 could be worked around: if HTML pages contain the full list of tracks, there would be no need to fetch pages of next tracks! 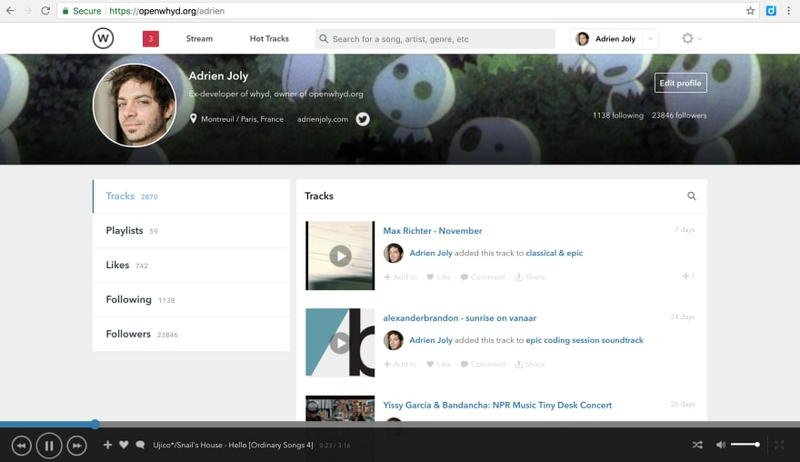 Patch the UI, so that the user can navigate between their profile and playlist pages. Constraint: I'm going to do my best to apply as few alterations as I can to Openwhyd's codebase (including its file structure), in order to these steps reproducible on its future versions too. Note: I'm writing this article while following these steps. Let's head to Openwhyd's official open source repository: github.com/openwhyd/openwhyd. Ok, now we have much fewer files to distract us from our mission! Let's try a naive move: save a playlist page from openwhyd.org to a HTML file and see if we can play a track from it. As you can see, that page uses absolute paths to all its assets. So we're gonna have to setup a web server locally that will give access to these resources from these paths. In order to respect that file structure, it would make sense to move the HTML file in the whydJS/public/ folder. That way, we can consider that is folder is gonna be the root of our web server, making both our HTML file and the asset subfolders accessible through it. As you can see, some elements of the UI still look broken, but the layout is working and you may even be able to play some of the tracks by clicking on them! This should make it work better, after refreshing the page! So far, we have a static HTML page in which the tracks are hard-coded. As we will want to turn that page into a template that will be able to render any playlist, let's download a playlist in raw format, without the HTML rendering. Fortunately, Openwhyd makes it easy to download a raw track list in JSON format, from any page. We just have to add the ?format=json suffix to the URL of that page. 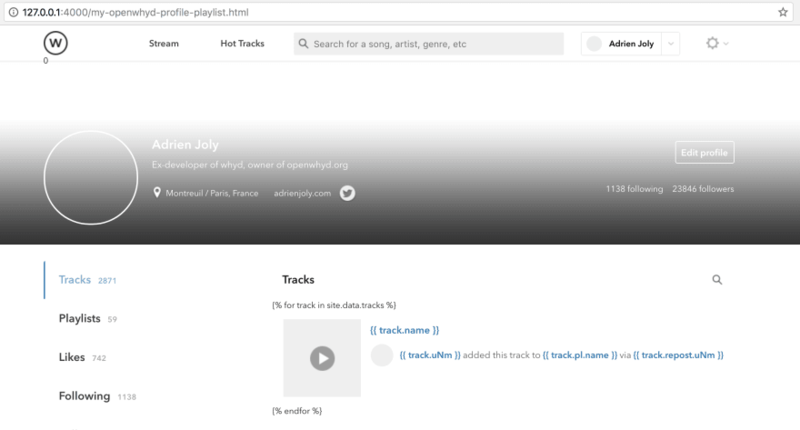 In my case, I want the track list of my profile, so I am going to download the JSON content of https://openwhyd.org/adrien?format=json and save it to openwhyd/whydJS/public/_data/tracks.json. 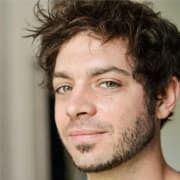 Feel free to reformat this JSON file using JSON Pretty Print, or to convert it to YAML using json2yaml.com if you want, but this is not required for the Jekyll template to work. Note: if you don't remember your Openwhyd username, you can also use the URL https://openwhyd.org/me?format=json. Basically, what we want to do is to delete the elements that represent tracks from our HTML file, and replace them by a Jekyll template. First, using our favorite code editor, let's cut and paste all these <div> elements into a separate HTML file (e.g. posts.html), so that we can use this HTML code as an example when we'll write our Jekyll template. 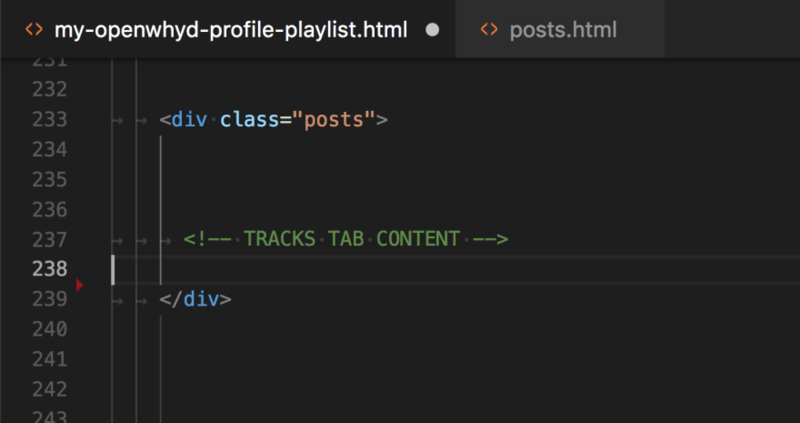 After doing this operation, your playlist's HTML file should contain a <div class="posts"> element that just contains the <!-- TRACKS TAB CONTENT --> comment. That's where we are now going to add our Jekyll template. In order to make it easier to build that template, let's copy the code of one of the posts that we moved out of our HTML file, except its child nodes that have the classes ago, stats, btns and ext, back under the <div class="posts"> element. Now, let's turn this sample post into a Jekyll template that can be used to render any track. In order to do that, we replace all the hard-coded values by mustache placeholders that contain the path of that value in any track from our tracks.json file. In order to test the rendering of this template, the python -m SimpleHTTPServer that we ran above will not help. So let's stop it (press Ctrl-C) and use Jekyll instead. The good news is that our page is properly served by Jekyll. The bad news is that our template failed to render. It looks like Jekyll did not interpret the template from the HTML file. Jekyll looks for files with front matter tags (the two sets of dashed lines --- like those in index.md) and processes the files (populating site variables, rendering any Liquid, and converting Markdown to HTML). Normally, the jekyll serve command should have detected this modification, and the track list should be rendered correctly from the JSON file, when opening/refreshing http://127.0.0.1:4000/my-openwhyd-profile-playlist.html in your web browser! I'm now done with my objective of the day: we turned an Openwhyd profile into a static Jekyll site. The list of tracks was downloaded in JSON format and used by Jekyll to render it into HTML, following the template that we wrote. 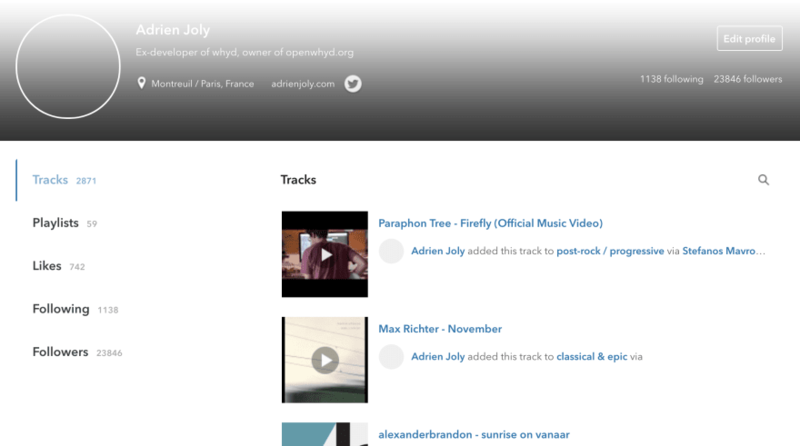 The next step will be to fix the navigation, so that visitors of the static version of my Openwhyd profile can also browse my playlists, following the same principle. In order to do that, I intend to use Jekyll collections. Until I get back to writing the sequel to this article, let me know in the comments if you have alternative ideas on how to make this work!